I’ve tried quite a few Korean CC creams in the past couple of months, and until now, I wasn’t too impressed. Asian CC creams, for the most part, are designed to provide color correction with less coverage than a BB cream (exactly the inverse of American CC creams, which provide significantly more coverage than American BB creams). I have good skin, but still prefer a little more coverage than a typical Korean CC cream provides. 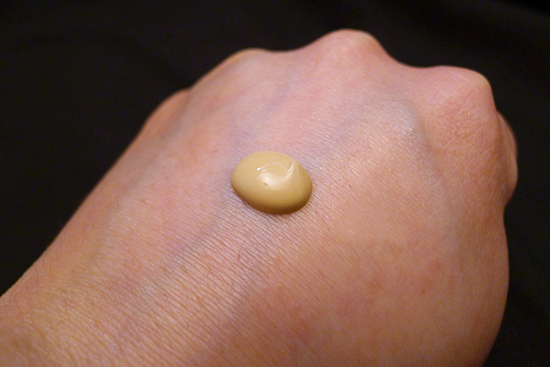 I came very close to assuming that CC cream just wasn’t for me, but then I found my CC cream soulmate: Hera Complete Care (CC) Cream in 02 Natural Beige. Nicknamed “Photoshop Cream,” Hera CC Cream promises to create transparent, gorgeous skin by covering flaws, evening out skin tone, providing moisture and removing oil. It also contains SPF 35/ PA ++, but as with any face makeup promising sun protection, you shouldn’t skip your standalone sunscreen. You would need a whopping ¼ teaspoon of makeup to get the actual sun protection the product promises! This product didn’t come with an ingredient list, which is very frustrating. It’s not on the box and it’s not on the insert – not in any language. I am determined to track it down, and when I do, I promise to update this review with ingredient details as I have in past reviews. The little bit of ingredient information I was able to find concerned something Hera is calling a “Cell Culture Cocktail,” which is said to contain apple stem cell culture medium, grape seed oil, Vitamin C, honey, hyaluronic acid, and vegetable protein. 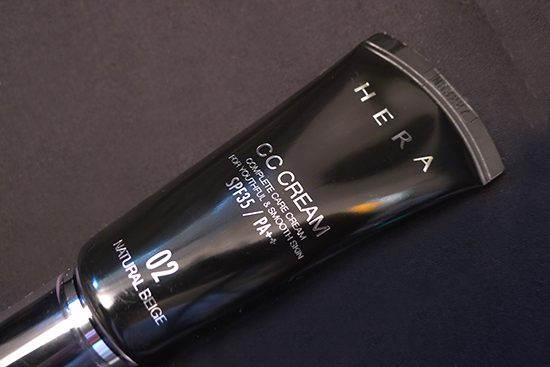 Unlike other CC creams I’ve tried, which are white when they are pumped out of the container and then turn a little more flesh toned as it’s massaged into the skin, Hera CC Cream comes straight out of the pump looking skin-toned. The color I’m using, 02 Natural Beige, is for yellow undertones while 01 Pink Beige is for pink undertones. Both colors are very fair – anyone with a skin tone deeper than NW20 or NC25 would have a hard time wearing either of these colors successfully. This CC cream is fragranced, but it’s a fragrance I thoroughly enjoy. It’s a light, fresh, floral apple smell, which disappears shortly after application. I like the smell so much that the disappearing fragrance actually bums me out a little, but it’s probably good news for the scent averse. 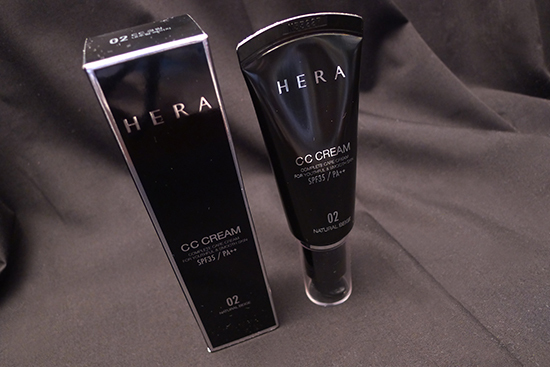 Hera CC Cream spreads easily and blends into the skin seamlessly. 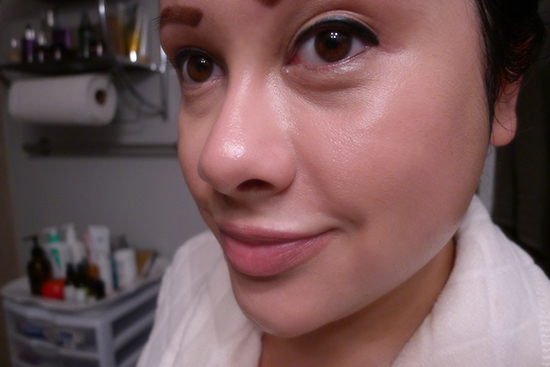 The finish is natural – not really matte, and not really dewy. 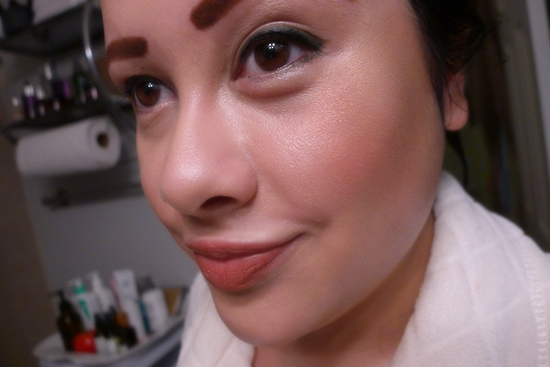 It’s slightly more dewy than a satin finish, in my opinion. It may be more matte for some than others – I happen to apply it over a very well-moisturized face, which slightly affects the finish. 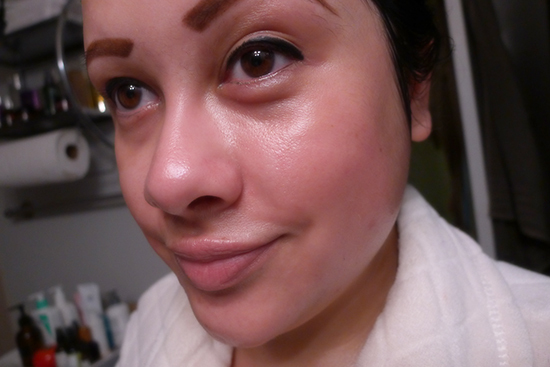 The coverage is very buildable – I’ve successfully applied up to 3, very thin layers (though I typically only wear one). Additionally, it does seem to absorb oil as promised, but it also did not cause any problems for my dry skin type. Hera Complete Care Cream has more coverage than any other CC creams I’ve tried so far. I would classify it as light to medium coverage, compared to something like Banila Co. It Radiant CC Cream, which I would say is very light coverage. Hera CC Cream successfully blends away redness, somewhat covers hyperpigmentation marks, and makes my pores appear significantly smaller. It also brightens my face in a way that looks really natural – my face is bright, but not off-color, not shiny, not even remotely glittery, and it doesn’t look wet. 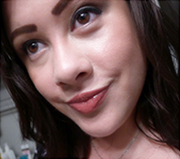 My skin just looks healthy and smooth – I can certainly see how the “Photoshop cream” nickname was earned. It does, in fact, look like my face has been digitally edited. The coverage lasts several hours before needing any touch-ups. I typically apply this in the morning at around 7:45, and don’t see fading until after I’ve returned from lunch at around 1:00 PM. It doesn’t look atrocious at that time – just a little faded, which is actually pretty impressive when you consider that I’m often walking for 20+ minutes outside in some insanely hot and humid weather during my lunch break! I’ve been using this CC cream 2-3 times a week, and though I don’t see any visible lasting skincare benefit, it has not made me break out at all. In fact, this CC cream is one of the few face makeup options I had that didn’t further inflame the insidious acne I was experiencing up until later last month. My final makeup look – Hera CC Cream in 02 Natural Beige with Guerlain Meteorites Pressed Powder in 02 Teint Beige, NYX Powder Blush in Cinnamon, Kevyn Aucoin Sculpting Powder (Cheek Contour), Kevyn Aucoin The Celestial Powder (Highlighter). I can’t remember what lipstick this is, but I like it. Hera is a high-end brand from Korean luxury cosmetic company, Amore Pacific, so this stuff doesn’t come cheap. Prices range from $38 to $55 at most online retailers. It’s a luxury item, for sure, but even so – I like it enough that I may even spring for a second tube tonight so I can keep one in my purse for late day touch-ups. Quality: 3/5 – I would probably give this product a much higher quality rating if I knew what the ingredients were. Value: 4/5 – This product is expensive as far as CC creams go, but it’s from a luxury brand and performs like a luxury product, so it’s still a good value if you can afford to splurge! I bought mine at W2Beauty, where it goes for $46 (with free shipping). If you’d like to pick yours up from W2Beauty as well, you can get a $5 voucher by entering my sponsor code at sign-up: 025605. If you do order from W2Beauty, be sure to say hello to Alice! Have you tried Whoo CC Cream? I’ve tried Hera, Ohui and Whoo CC Cream. And I like Whoo better. But have to agree with you, when it comes to natural nomakeup finish, Hera is the winner. I haven’t tried Whoo yet, but I really want to! How is the coverage for that one? Did you like the Ohui one at all? Nice review! Finally another CC cream without color changing beads. Yeiii. I like it! And I like how it looks on you…And if I have left a buit more money at the end of a month I will think back to this review and buy it! Thanks! I still need to try this one out =/ i’ve heard great things about it but it’s so expensive!!! Yeah, that price point is a bummer!